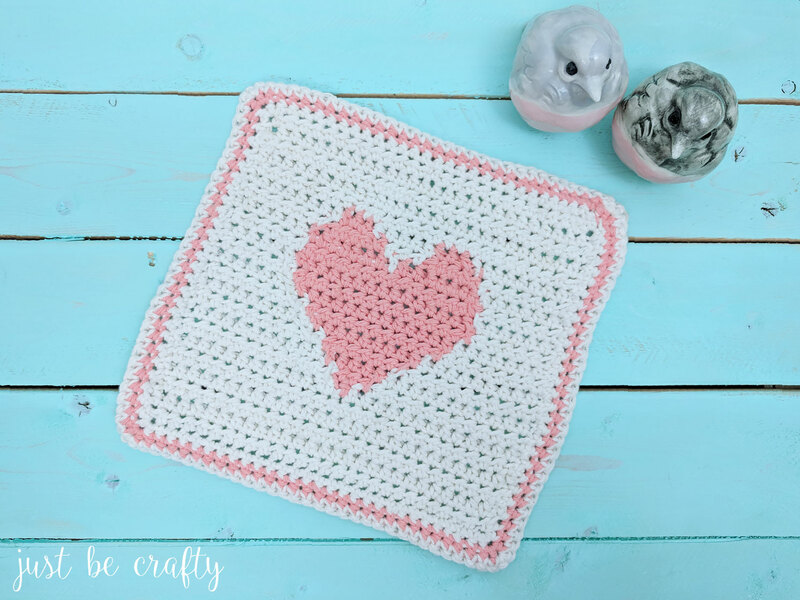 The Lovebird Crochet Washcloth Pattern is the perfect project to whip up just in time for Valentine’s Day! 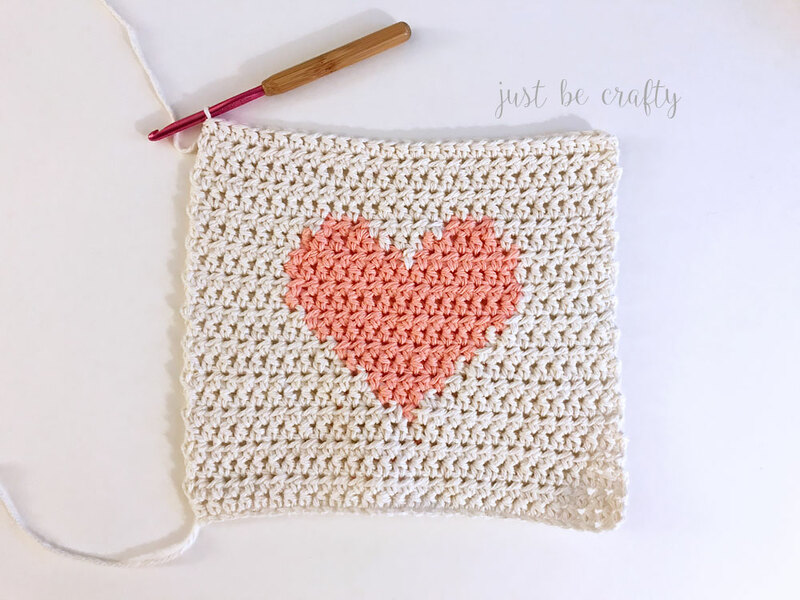 Made with 100% cotton yarn, this adorable washcloth features a simple heart shaped intarsia design. Hello and welcome back to my blog! 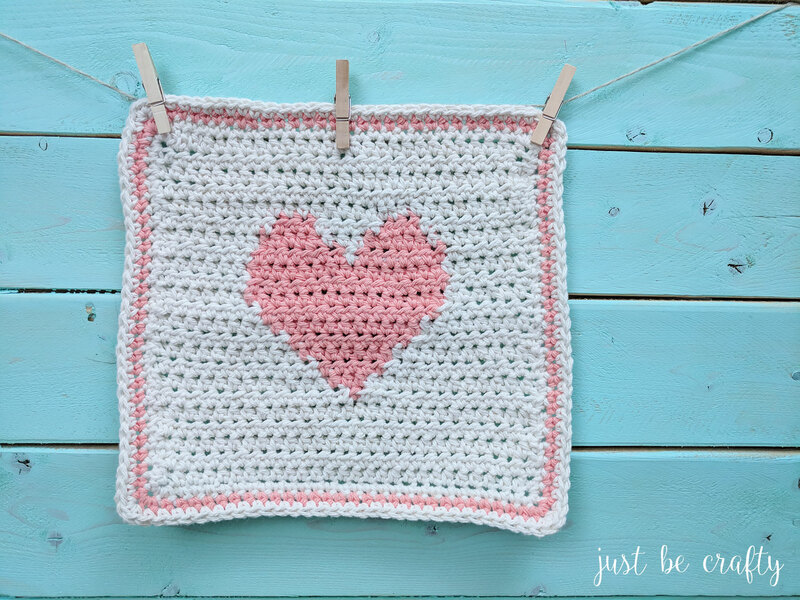 Today I am sharing a new pattern with you – the Lovebird Crochet Washcloth Pattern. It is a super fun and fairly quick n’ simple project. It could totally double as a dishcloth too, but I thought it would make for a really cute washcloth! Whip up one for yourself and friend – pair with a few of your favorite skincare goodies in trendy bag or basket and you have yourself the most unique and adorable little gift set! This washcloth is my first design to feature the intarsia technique. Intarsia is similar to Fair Isle in that you create a design in your crochet work by using different colors of yarn as you work, but the main difference is that Intarsia is reversible and Fair Isle is not. With Fair Isle, as you change colors the yarn strands are carried behind the work but with intarsia, each color change is worked with a separate ball of yarn. Working with separate balls of yarn per color change is what makes intarsia reversible! 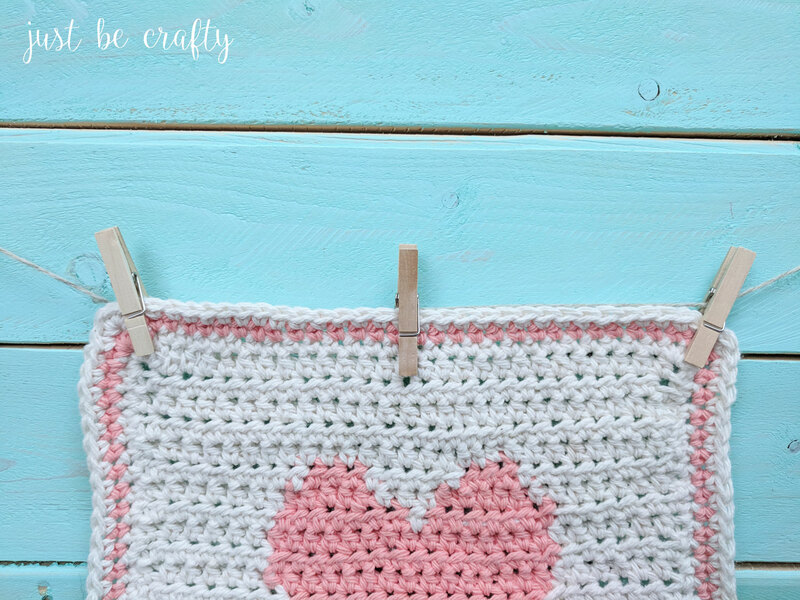 Working intarsia is really quite simple – you just crochet as you normally would but will be working with multiple balls of yarn as you crochet across the row. In the pattern I share some techniques to help make sure your finished piece is a success! 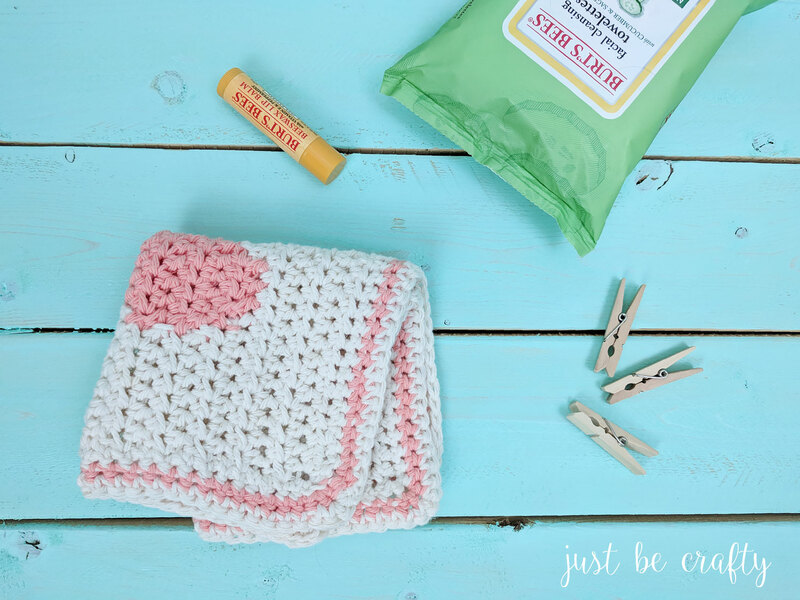 To make your own washcloth, see the pattern below. In this pattern I instruct to split the yarn colors into separate balls (see materials section) so that when you switch colors you are working with separate balls of yarn and not carrying the yarn along as you go. The technique of changing colors by using separate balls/bobbins of yarn is called intarsia. I used a combination of a couple bobbins and the main skeins of yarn. I like to work with bobbins because they make the colors easier to contain and less likely to tangle when making color changes. You may have more ends to weave in as you’ll be working with smaller chunks of yarn at a time, but its totally worth it in my opinion :). Keep all yarn tails on the back of your work. (Even rows are worked on the back, odd rows are worked on the front. When changing colors – on your last stitch before a color change, stop before your last yarn over and yarn over with the new color. With main color, start by chaining 29. Row 1: Starting in 2nd chain from hook, hdc and hdc in each chain across row (27). Turn. Row 2: Ch 2 (does not count as a stitch), hdc in each stitch across row (27). Turn. Follow chart below. Each square represents one stitch. For example, Row 1 begins at square 1 – 1, and you will work your way from right to left. Row 2 begins at square 27 – 2, and you will work your way from left to right. Rows 6 – 11: Continue working the graph back and forth in rows as you did in Row 2. 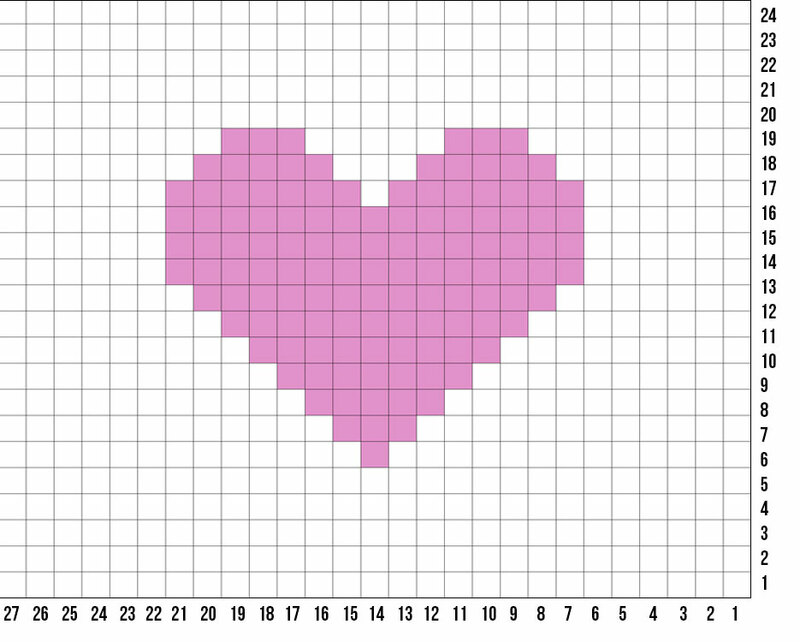 The heart image begins on Row 6 (see color change tip in notes section as well as below). Row 6 (and all even numbered rows) will be on the back of your work. Keep all yarn tails on this side so that when you finish, the front of your work will look cleaner. See below for color changing tips. Both examples show your work on an even row (aka the back of your work). Rows 12 – 14: Use 3 balls of main color and 2 balls of contrast color. Keep working back and forth in rows as you have for the previous rows following the intarsia chart. Color changes end at Row 14. Rows 15 – 19: Continue pattern until you reach the end of Row 19. You will now be working in rounds. Lay your piece in front of you with the right side facing up. Round 1: Starting along the left most side edge, ch 1, and make 3 sc in the corner stitch you are currently in, and make 24 sc evenly along the side edge, 3 sc in the corner, sc along bottom, make 3 sc in next corner, make 24 sc evenly along the right most side of work, make 3 sc in corner stitch, and sc along top edge. Join with 1st sc of round using a slip stitch. Secure and cut yarn. Round 2: Ch 1, sc around border, making 3 sc in each center corner stitch. End round by joining with 1st sc of round using a slip stitch. Secure and cut yarn. Hi there! I shared this pattern (with credit, of course!) on my blog about summer projects. Here you go: http://kaijumaddy.com/2018/06/14/11-free-crochet-patterns-for-summer/ Thank you! !